IconsOfIndia: Murphy Radio & the Baby That Got All of India Glued to News!!! This Republic Day, we take a look at the iconic objects that collectively defined the Indian experience over the past 68 years. From things that brought the world to our living rooms to tasty treats, take a nostalgic journey down memory lane! Members of the Joshi family would gather around their prized possession at 7 every evening. The main door of the house was open–it wouldn’t be long before the neighbouring kids, their parents and maybe even grandparents joined the regular party. A beautifully knit blue-green cover protects the wooden radio box which is only taken off when the radio is switched on and tuned in. One member of the family reaches the top shelf to pull out the long antenna of the radio and turns the two knobs till the radio frequency sets perfectly. In the 1960s and 70s, when the television was still a rich man’s luxury, it was Murphy Radio that brought people together. Although the radio set was a device even the upper-middle-class boasted on owning, it was still more accessible and affordable than the TV. Source: India Design Museum/ Facebook. 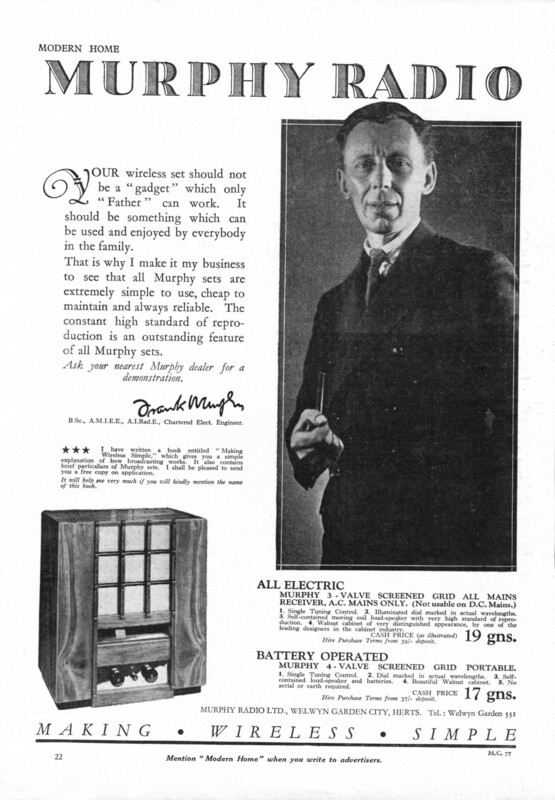 The Murphy Radio was founded by Frank Murphy and E J Power in 1929. The radio company had manufactured sets for the British Armed Forces to use during the Second World War, but they aimed to make radio sets “a homely gadget”, one that did not need military expertise to operate. Although the founder left his company in 1937 to establish another called the Frank Murphy Radio or FM Radio, the name ‘Murphy’ stayed. This brand debuted in Indian households in 1948–just a year after we got independence and even before we became a republic! Immediately, it became a popular source of news and entertainment. 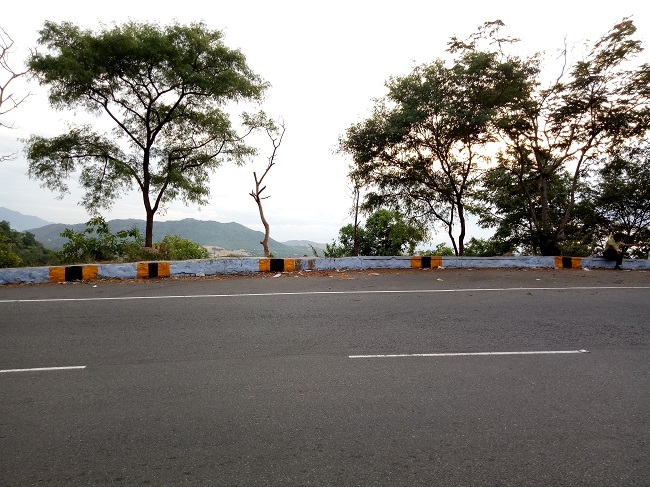 Jyoti Sohini, a 70-year-old homemaker from Pune, fondly recollects the ‘Murphy days’. “It was a very popular brand in those days. The Murphy Baby calendar especially was very famous. 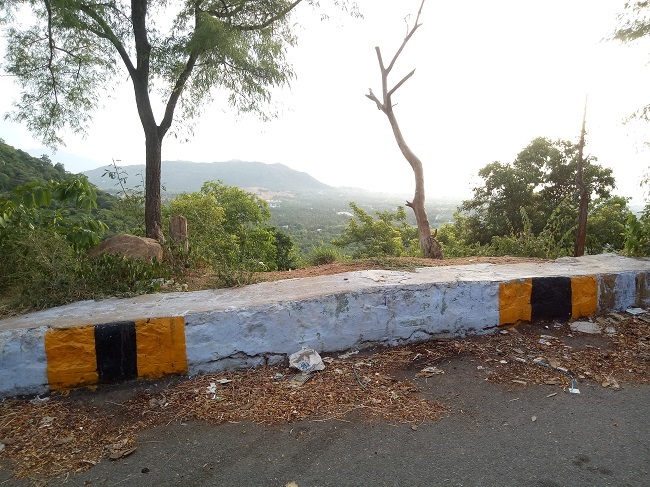 The radio set was a common possession where I lived, but even then, there would be a huge crowd at our place, eager to listen to the cricket commentary,” she tells The Better India. 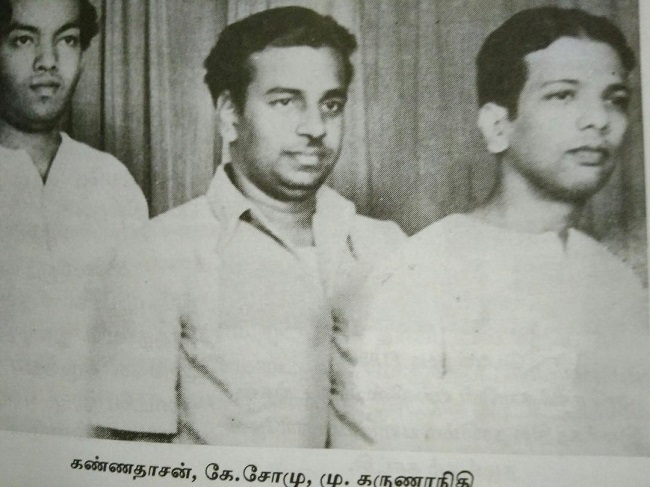 Adding to the programmes that they listened to in that era, Jyoti says Radio Ceylon, Binaca Geetmala, Vividh Bharati and Pune Kendra (a local news bulletin) were popular. Much like this family in Pune, India fell in love with the brand and its adorable mascot–the Murphy baby or Murphy Munna. 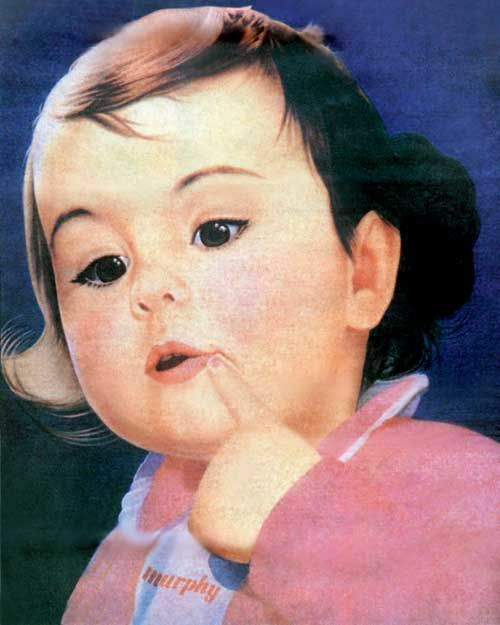 Print ads featured the chubby-cheeked Rinpoche, looking inquisitively, with a finger placed near his lip, instantly garnering the adoration of Indian families. The three-year-old Kagyur Tulku Rinpoche fascinated many mothers or expectant mothers of that era. For millennials like me, the perfect reference point is Anurag Basu’s 2012 film, Barfi, where Ranbir Kapoor’s reel life mother names him after the Murphy because “Murphy Munna jaisa lalla, Amma ka tha sapna” (Mother wanted a baby just like the Murphy’s). Speaking to the Hindustan Times about this shot to fame, Rinpoche said, “I was three years old and used to reside in Manali. Everyone in Manali knew about the ad. 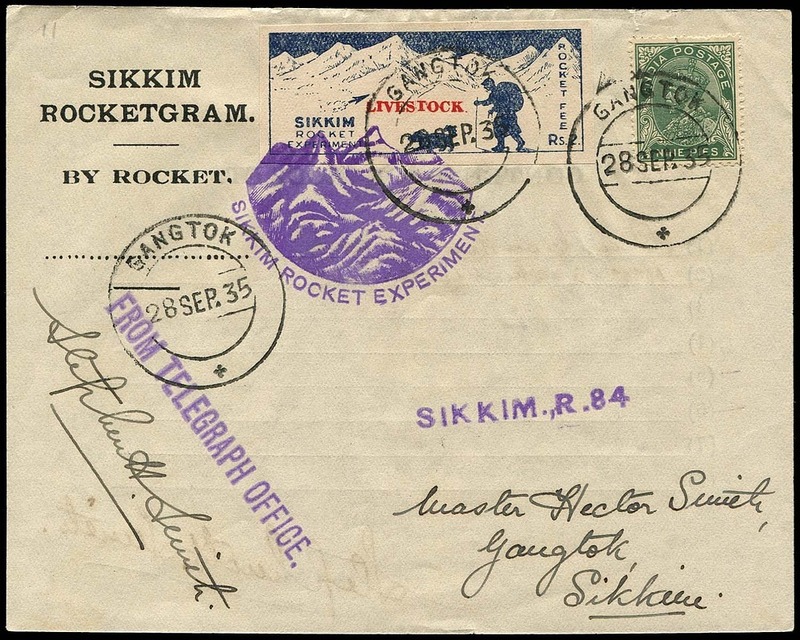 Rinpoche went on to become a monk for about 20 years before marrying Mandakini, an actress. But that is a story for another time. Much like Rinpoche, Mohammed Rafi composed a tagline jingle for the brand to attract more customers. 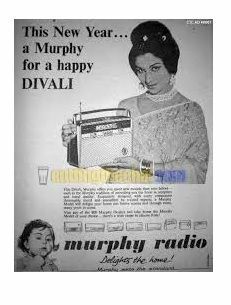 “Murphy ghar ghar ki rounak, tarah tarah ke Murphy radio, la deten hain ghar mein jaan (Murphy is the pride of homes, different kinds of Murphys bring life to the home),” played as an advertisement while superstars like Sharmila Tagore, featured in print ads. 68-year-old Kamlesh Chawla speaks to The Print about his childhood when he threw a tantrum to get a Murphy Radio after the Sharmila Tagore ad. Catchy phrases that spoke of the Murphy Radio as something that “delights the home” and “sets the standard” added to the aspirational sentiment. Eventually, the radio gave way for black-and-white TV, which in turn, was replaced by the colour TV and now, the Internet. 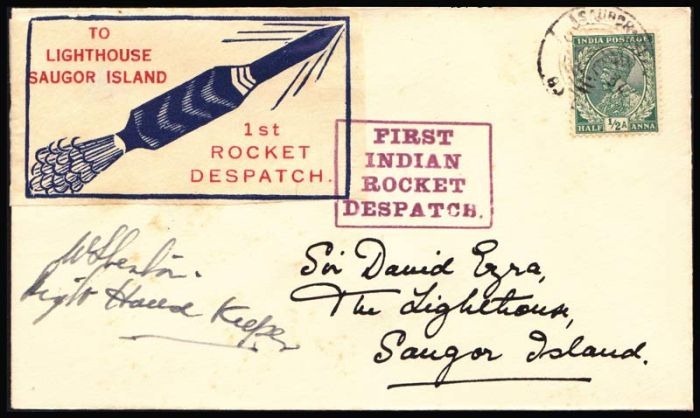 Even as we surf the web to find such fascinating stories about the times and technologies of the past, the simplicity of the radio and the magnificent events it covered–right from Nehru declaring India’s independence in the speech that still gives us goosebumps to the wars that India fought later–can hardly be replaced. 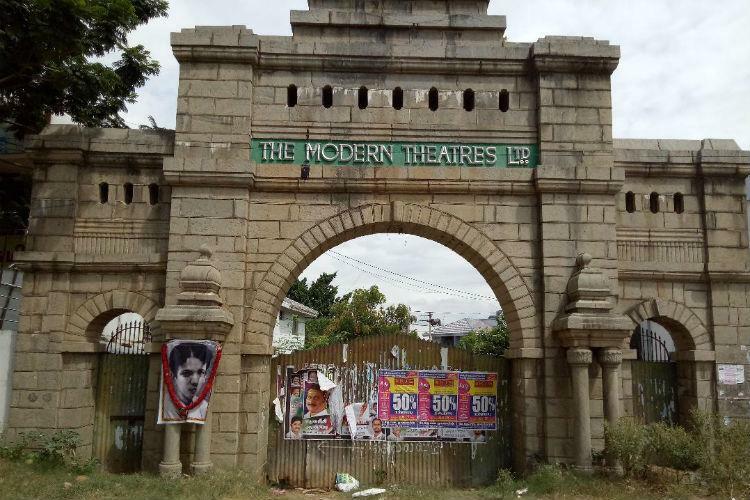 The Theater That Shakespeare Stole ….!!! On a cold, snowy December night in 1598, about a dozen men armed with swords, daggers and axes quietly broke into a recently vacated theater in Shoreditch, located just outside the city of London. With the aid of what modest light their lanterns could throw, the men worked tirelessly all throughout the night, dismantling the theater beam by beam and nail by nail, and loading the stripped timber onto wagons. By the time the darkness of the night gave way to the first light of dawn, the theater was gone. The vandals in question were the Lord Chamberlain’s Men, the theatrical troupe to which William Shakespeare belonged. For the past several years, the Chamberlain’s Men had been playing at Shoreditch’s Theatre. 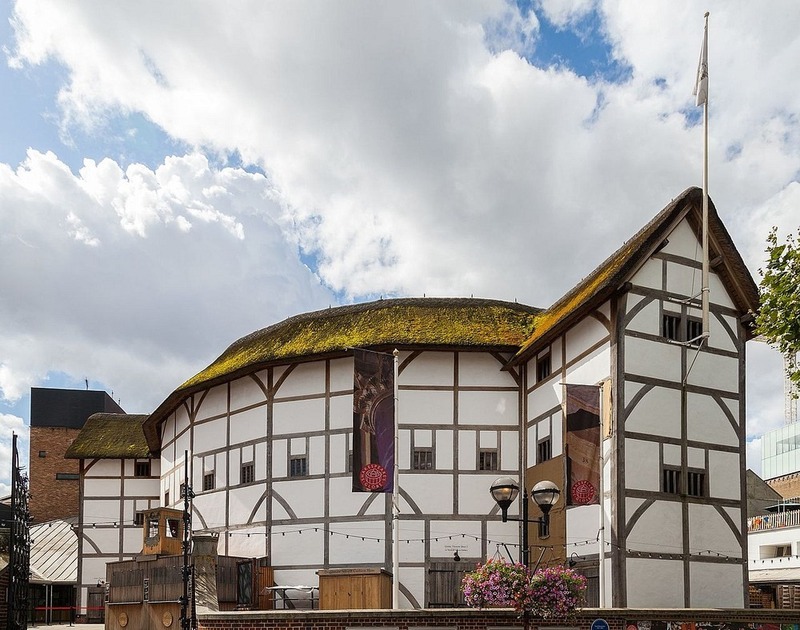 This theater, built in 1576, was the second permanent theater ever built in England, and the first successful one to be built for the sole purpose of theatrical productions. The Lord Chamberlain’s Men was founded in 1594, and within a short period of time it became one of the leading theatrical companies in London. Shoreditch’s Theatre was their home, and over the years, the Chamberlain’s Men played many of Shakespeare’s most famous plays on this stage. In 1596 the lease for the property on which the Theatre was built expired, and the Chamberlain’s Men tried hard to negotiate an extension with the stubborn owner, Giles Allen. Not only Allen refused to renew the lease, he threatened to take possession of the theater as well. The dispute dragged on for two years, during which time the company performed at the nearby Curtain playhouse. It was at Curtain Theatre that Shakespeare debuted what is arguably his most famous play, Romeo and Juliet. 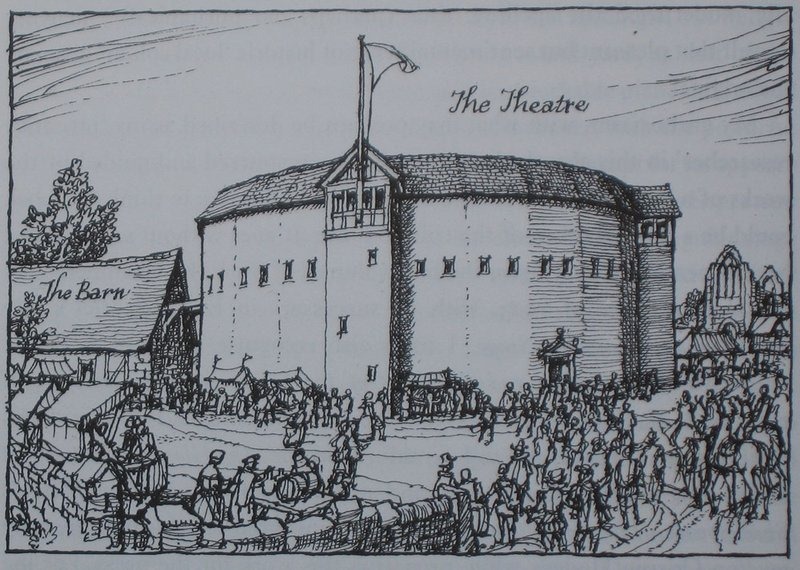 The Theatre of Shoreditch, the one that Shakespeare’s men dismantled. When it became clear that Giles Allen wasn’t going to give back the land, the Chamberlain’s Men leased a new plot by the Thames, and on 28 December 1598, while Allen was celebrating Christmas at his country home, the men stole into the Theatre and carefully tore it down. 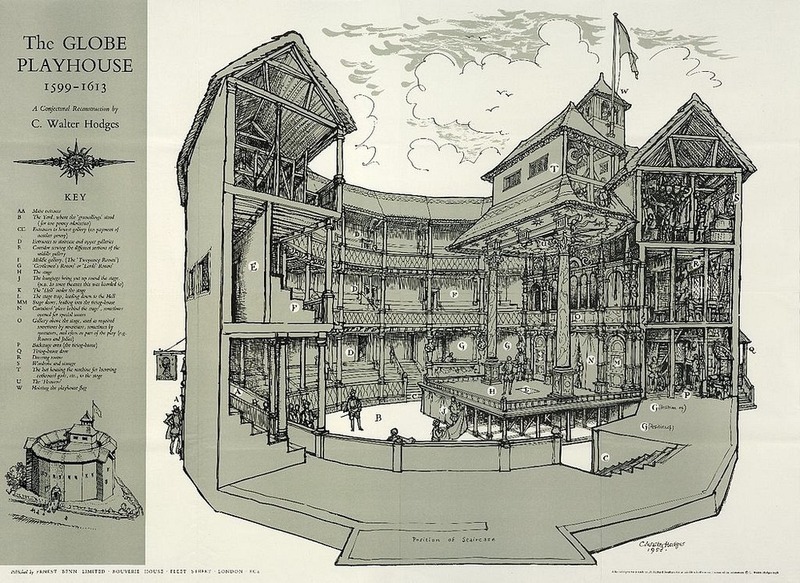 A talented carpenter named Peter Street, who would later build another historic London theater named Fortune Playhouse, recycled the old pieces of wood into an astonishing new theatre—the Globe, capable of holding up to 3,000 spectators. The romanticized version of the story holds that the Theatre was dismantled during the course of a single night, but historians believe the job could not have been completed in such a short time. Also, there is no proof that Shakespeare was present during the night, although he most certainly would have been following the proceedings closely, for he did have a tremendous interest in having this job done right. Initially the timber was stored in a warehouse near Bridewell, until the following spring, when the materials were ferried over the Thames and used to construct the much larger Globe. Reconstruction of the Globe theatre based on archeological and documentary evidence. The Globe was up and running by early 1599, and for the next 14 years it presented many of Shakespeare’s greatest plays. In 1613, during a performance of Henry VIII, a misfired stage cannon ignited the thatched roof and the theatre burned to the ground. Although the theatre was quickly rebuilt, Shakespeare probably never wrote for the second Globe. Eventually, like all the other theaters in London, the Globe was closed down by the Puritans in 1642. A modern reconstruction of the Globe, named “Shakespeare’s Globe”, now stands on the Thames approximately 750 feet from the site of the original theater. It was built in 1997, based on an approximation of the original design, but with only half the capacity. The new theater was designed to be as authentic as possible to Shakespeare’s 16th century theater. The structure is made of timber alone without any steel support, and it is the only building in London with a thatched roof, since that material was banned after the Great Fire of 1666. Seats are simple benches, although spectators can request cushions during shows. No spotlights, microphones or any kind of modern audio equipment are used. All music is performed live, most often on period instruments, just like it was in the 16th century. Only recently, the Globe began experimenting with lighting and sound rig. Why Do Many Historic Buildings in The UK Have Bricked Up Windows?…!!! There was a time in Great Britain when having windows in homes and buildings were prohibitively expensive. That time began in 1696 with the introduction of the much-despised window tax, that levied tax on property owners based on the number of windows or window-like openings the property had. The details of the tax kept changing with time, but the basic premise was that the more windows the house had, the more tax the owner had to pay. In the eyes of the legislature the window tax was a brilliant way to put the burden of tax on the shoulder of the upper class. The rich usually had larger houses with more windows, and so were liable to pay more taxes. Poor people, on the other hand, lived in smaller houses and so paid less. To make the system even more attractive to the poorer class, those houses with fewer than ten windows were exempted from the window tax altogether. But the tax was not nearly as progressive as it first seemed. In towns and cities, many poor families lived in large tenement buildings with many windows, and were therefore subject to heavy window tax assessments. The tax was paid by the landlord but the costs of the window tax were passed on to the residents in heavier rents. But the most fundamental error was the assumption that people wouldn’t respond in creative ways to avoid tax. Many people with a lot of windows started bricking up windows instead of just paying the tax. And often when new buildings were built, the number of windows were reduced, and at times, completely eliminated to avoid tax. The legislation also failed to define a window, allowing tax collectors to charge anything that remotely resembled one including perforated grates in larders, leading to much resentment among all section of the society. It was novelist Charles Dickens who gave voice to these dissatisfaction. The adage ‘free as air’ has become obsolete by Act of Parliament. Neither air nor light have been free since the imposition of the window-tax. We are obliged to pay for what nature lavishly supplies to all, at so much per window per year; and the poor who cannot afford the expense are stinted in two of the most urgent necessities of life. 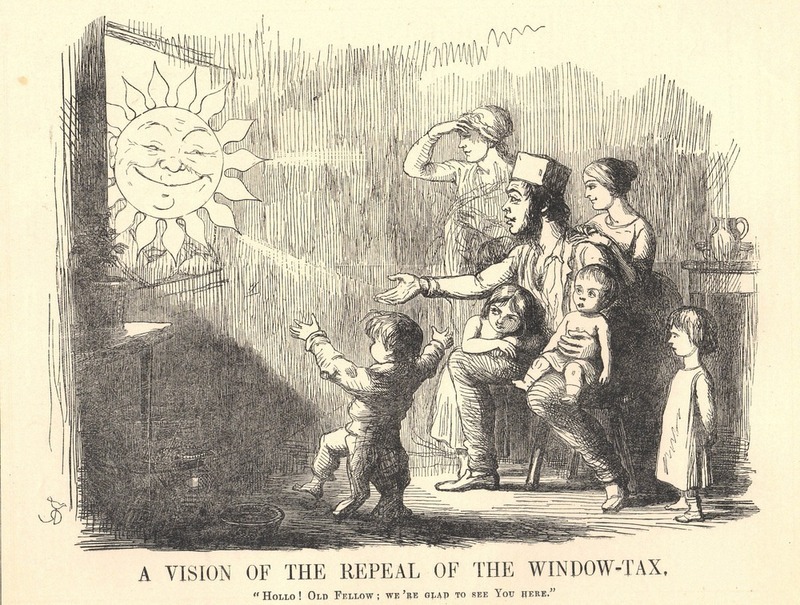 One year later, in 1851, the window tax was repealed—156 years after first being introduced. The window tax was just one of scores of absurd taxes designed by the British government to raise money. Another one was the brick tax introduced in 1784, during the reign of King George III, to help pay for the wars in the American Colonies. Again the people responded by increasing the size of the bricks so that fewer bricks are needed to raise a house. Many buildings built with oversized bricks still stand in Measham, Leicestershire. Similarly, between 1662 and 1689, tax was levied on the number of hearths or fireplace in a dwelling, encouraging people to crowd into smaller dwellings and go without fire in some cases to avoid the tax. But the window tax was by far the longest lasting and the most hated. Even today, the legacy of the window tax can seen be seen in the bricked-up windows in many historic buildings across Britain. Bonus fact: The term “daylight robbery” is believed to have stemmed from window tax since it essentially amounted to robbing people of daylight through an unfair mean. 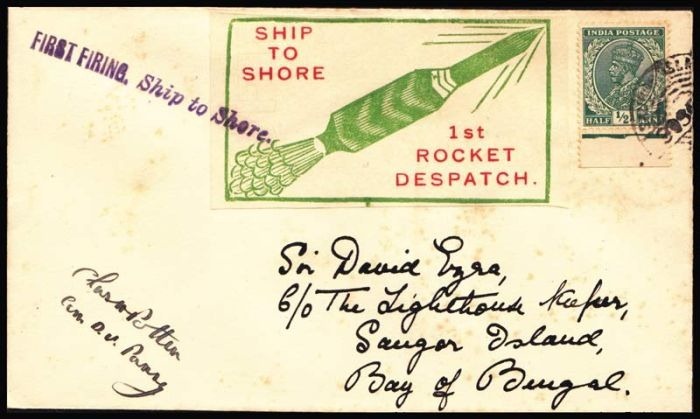 However, the first printed use of the phrase didn’t occur until 1916, and even then the context didn’t explicitly link it to unfair overcharging. 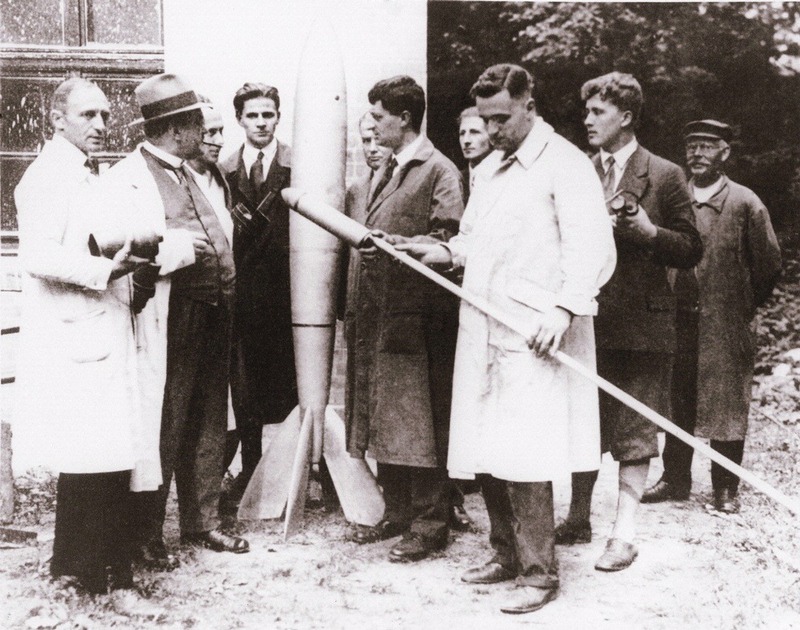 It was only after 1949 that the phrase was firmly associated with “unfairness”. 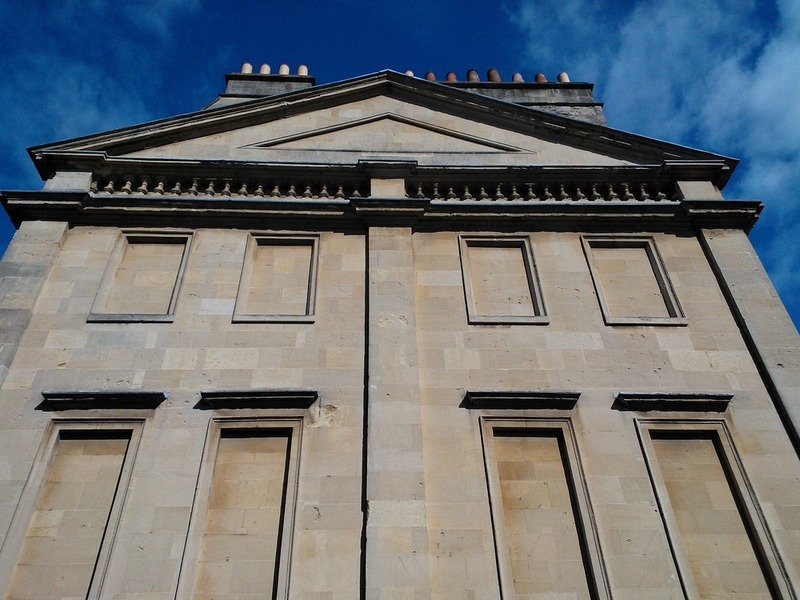 Because of this disconnect—both in time and in meaning—between window tax and the phrase, some etymologistbelieve that the relation between the two is a myth. 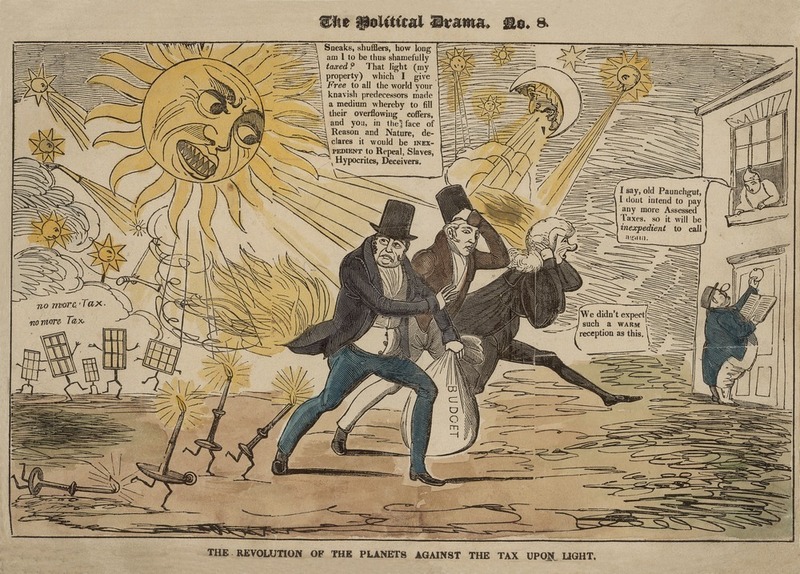 A satirical cartoon titled ‘The Revolution of the Planets Against the Tax Upon Light’ in response to the wi ndow tax introduced in 1696. A family looking forward to seeing more of the Sun when the Window Tax would be repealed. Cartoon by Richard Doyle, 1754. Wojtek: The Bear that drank Beer and went to War …!!! 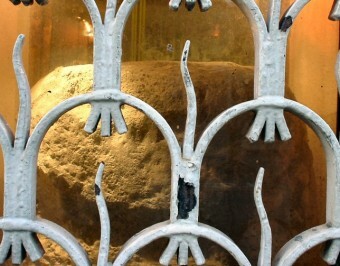 THE ANCIENT STONE IN LONDON THAT IS SUPPOSED TO BE IMPORTANT BUT NO ONE REMEMBERS WHY…!!! Sitting in the heart of London since long before anyone can remember, theories regarding the London Stone range from Roman ruin, to Druidic icon to a talisman of good fortune. Although many point to John Stow’s Survey of London(1598), where he sets the 10th century as the first mention of the stone in print (he claims he found a mention of the stone in a document from the 900s AD), others feel more comfortable citing a list of Canterbury Cathedral’s properties from somewhere around the turn of the 12th centuries, where it lists Eadwaker æt lundene stane. Regardless, by medieval times, the London Stone was a fixture in the city, so much so that residents even incorporated it into their names, such as Ailwin of London Stone. Clearly important, by the 15th century the landmark was seen as a symbol for London, and perhaps England; this helps explain why, when Jack Cade led a rebellion against Henry VI in 1450, he reportedly struck the London Stone with his sword in claiming the city for himself, as immortalized by Shakespeare in King Henry VI, Part II, Act IV, Scene VI. In the 16th century, one popular theory for the stone’s origins was that it had been used by the Roman’s during their occupation (approximately 43 AD – 410 AD) as a millarium or central milestone from which all distances were measured. Charles Dickens even cited this explanation in his Dictionary of London (1879). During the 18th century, some were speculating that the stone was used in worship by the Druids, although there is no evidence to support it. By the 20th century, serious archaeologists began digging into the London Stone’s origins, and some found that it is situated at the center, or at the gate, of where a large Roman structure, sometimes identified as a Governor’s palace or pretorium, had been. Today, those who believe in ley lines, straight “lines” that connect sites of historical or geographical significance, claim that the London Stone is transected by several of these lines, while others have posited that the stone was set in the center of the old Roman city, in homage to Jupiter.